Zoinks! 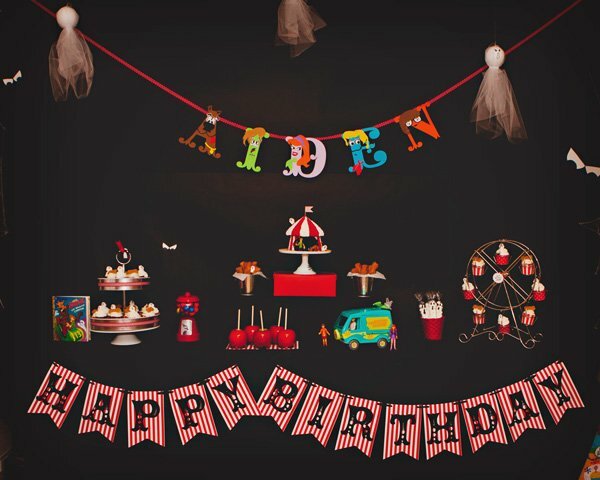 Buckle up & get ready for a spooktacular ride in the Mystery Machine to this awesome Scooby Doo “Haunted Carnival” Party by mommy Alejandra Morin of The Marshmallow Studio for her 4th birthday boy Aiden! 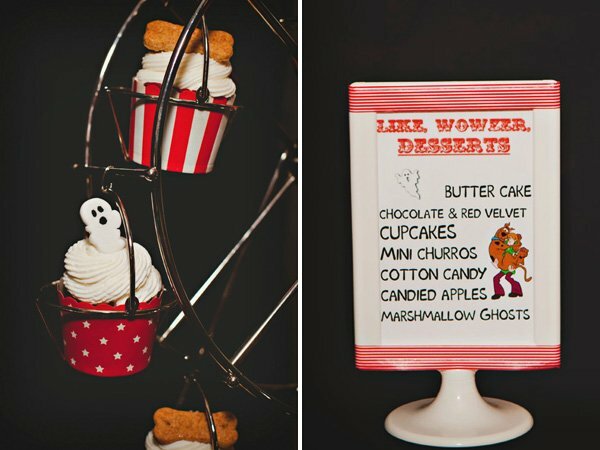 With lots of fun games, delicious carnival snacks and beautiful photographs by Wendhy Jeffers Photography, this haunted celebration looks like a groovy good time! 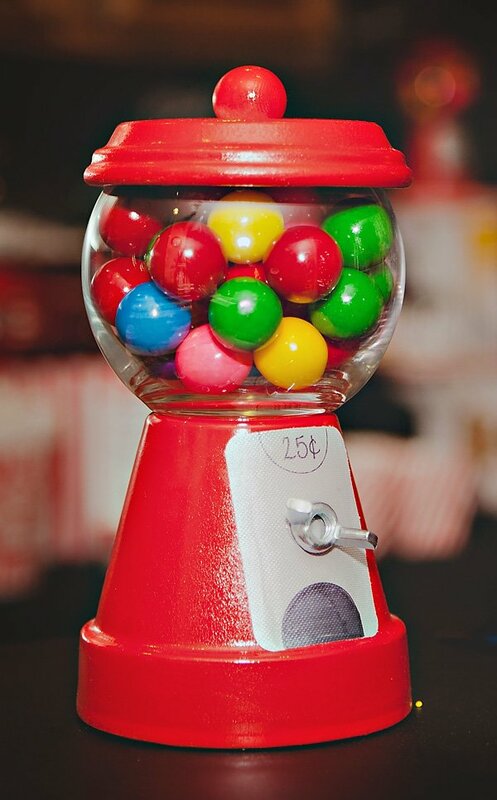 Gum Ball Guess, Ring Toss and more Carnival Games! My eldest son, Aiden, loves Scooby Doo. He can sit and watch it all day long if we let him. I don’t mind buying him all the movies because I think it’s one of the last “good” cartoons left. No violence, no foul language and it has innocent humor. When we asked him what he wanted his 4th birthday party to be of he said “Thomas the Train” but (thankfully) a week later he changed his mind. He wanted a Scooby Doo “spooky” party. My wheels started turning. I didn’t want to have the traditional 60’s bright theme and I had to incorporate the spooky somewhere in there. I began researching all the episodes and “bad guys” I could use in the party. I came across the “Haunted Carnival” episode and thought it would be perfect. 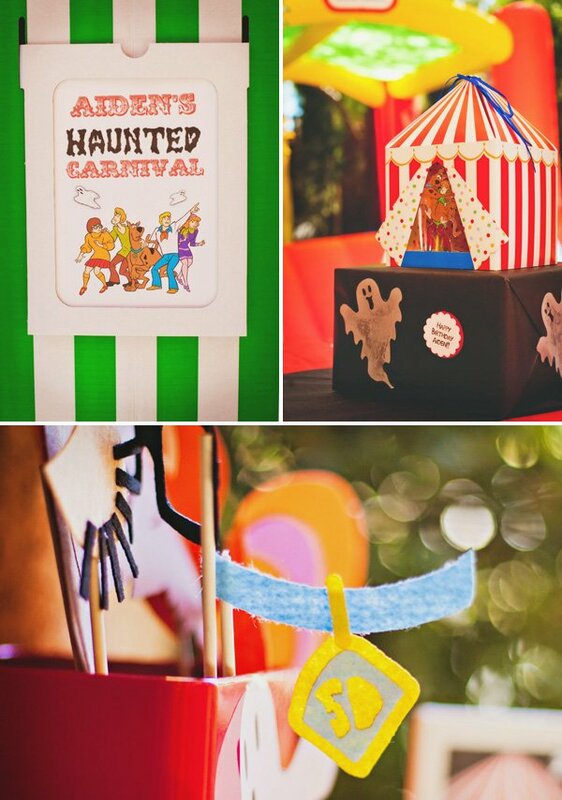 We would have a carnival, a Scooby Doo theme and spooky ghosts everywhere. It was perfect!!! I had the absolute pleasure of working with Wendhy from Wendhy Jeffers Photography. She is just the sweetest and a total professional. I had been looking for a good photographer to work with in Las Vegas and I am very happy to say I have found it! She understand the party world and caught all the details I wanted her to without me even asking her to :) That’s a great photographer. She even mastered getting good pictures from inside my house where it’s very dark and difficult to shoot right. She rocks and I totally recommend her. I purchased a pack of black blank invitations with envelopes and a few red & white stripped scrapbook sheets from Michael’s. I cut out tent shapes and glued them to the front of the cards then I designed carnival tickets for the inside with all the information. I hand-drew ghosts and printed the gang characters on a sticker. 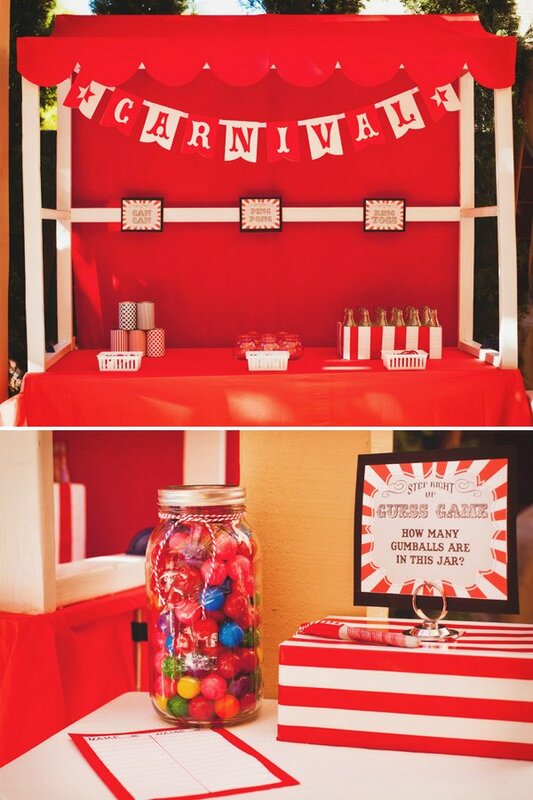 To welcome guests, I hung a carnival banner and made a gumball wreath. This wreath weighed 15 lbs! I used a foam wreath, about 300 Bubble King Assorted Gumballs from SweetWorks and a hot glue gun. I made an 8-foot directional post with scrapbook sheets, printed signs that I designed, glue and a wood dowel. We started the party with a fun photo booth at the entry way. 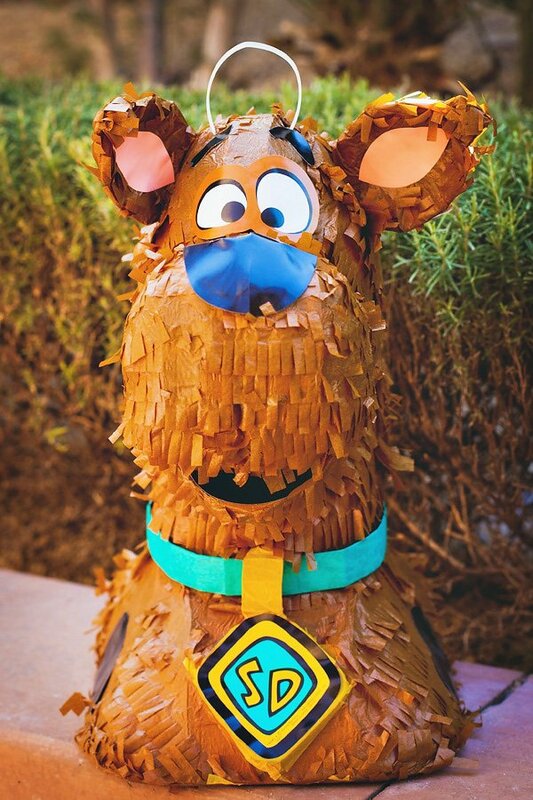 I purchased Scooby Doo character props from Kitty Dune Cuts on Etsy. They were hilarious! I’d say our guests had a fun times being Velma, Fred, Daphne, Scooby and Shaggy. My lovely friend Dina from Deliciously Darling was so sweet to make these die-cut letters for me. I used them to make banners. I simply glued them to cut out scrapbook sheets and outlined them with red glitter glue. I held each pennant to the banner with white ribbon. I also hung spooky ghost all over the ceiling. I made them from styrofoam spheres, white tulle, hot glue, a sharpie and fishing string. They were super easy to make and looked awesome hanging throughout. 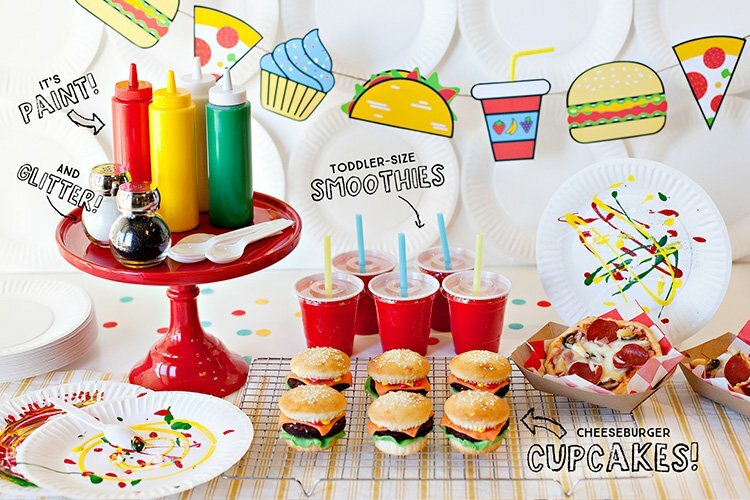 Although, we usually try to serve awesome food at our parties, this time we had to go with traditional carnival food – pizza, grinders and nachos. It was all still yummy…. I think Shaggy and Scooby would agree! My favorite part of the menu was the hot sauce bar. We had a hot sauce everyone from whimps to hot peppers eating champs. We refreshed the crown with carnival favorites – popcorn, peanuts and lemonade with additional goodies like veggies, fruit kabobs, and cucumber water. Guests were able to season their popcorn just the way they’d like to. 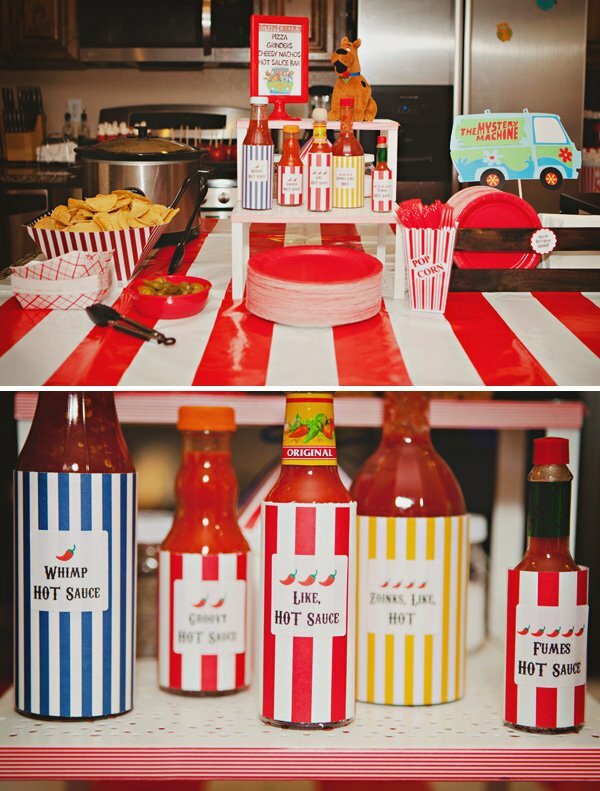 We had toppings such as kettle corn, buffalo wing, nacho cheese, white cheddar and butter spray. 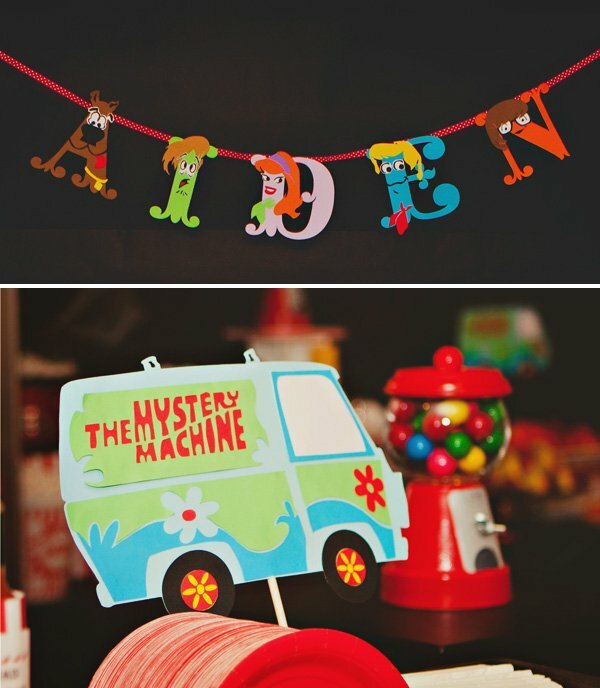 Dina also made these super cute Mystery Machine paper decorations. I’m telling you, this girl thinks of everything! Outside we had all the games and prizes. I used the same canopy I made last year for Aiden’s 3rd birthday party and just changed the felt cover. 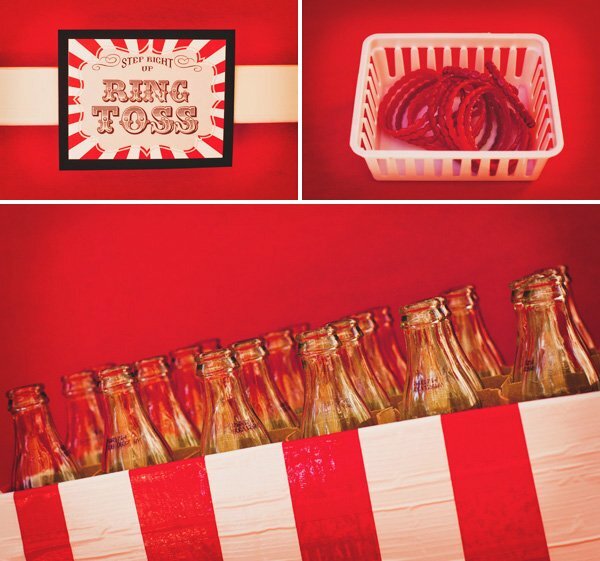 We had 5 games – can can, ping pong, ring toss, bean bag toss, and guess game. The kids had a blast. They were all out there playing and redeeming their tickets for prizes. I designed signs to go with each game. I covered empty aluminum cans with scrapbook paper sheets and tape. I used red and white duct tape to decorate the bottle box which was a beer box cut half way down. It was easy and made the box super sturdy. I couldn’t find toss rings so I purchased girl’s bracelets for $1 and spray painted them red. 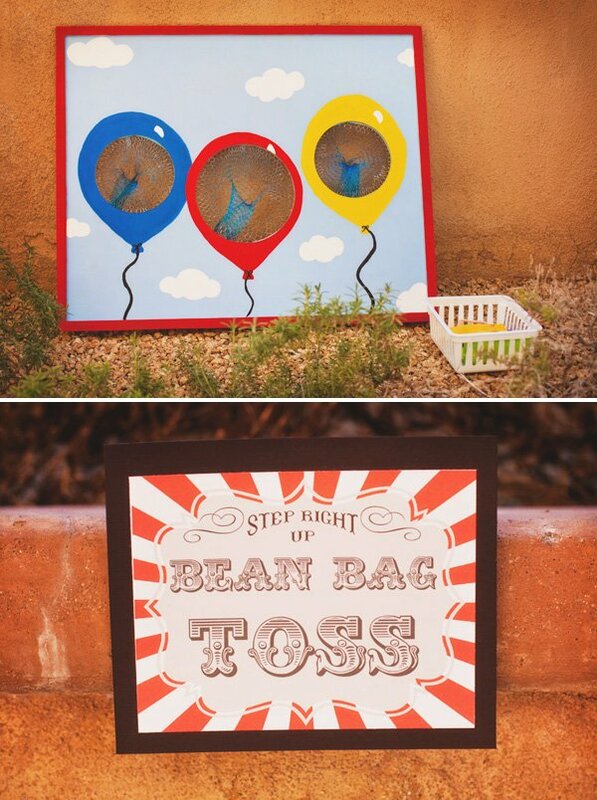 I had a monkey bean toss board that I purchased for Keiran’s 1st birthday party that was stored away since. I decided to pull it out and paint over it with acrylic paint to make a more suiting board. I ended up painting balloons! I loved the way it turned out and the fact that I didn’t have to buy another one was awesome too. I filled a large mason jar with gumballs and had guests guess how many gumballs were in it. Adults enjoyed this game the most. The winner took the jar with all the gumballs. The little market stand we purchased from Ikea made the perfect prizes stand. I hung a little banner, filled aluminum tubs with prizes and glued little labels on each tub. We had all kinds of toys as prizes – pinwheels, clappers, bubbles, Scooby Doo stickers and tattoos, whistles and rings. I made a dozen of Scooby Doo phrase signs to hang all around outside. Phrases like “zoinks”, “jeepers”, “jinkies”, “meddling kids”, “my glasses!”,”Scooby Doo where are you?” and many more. 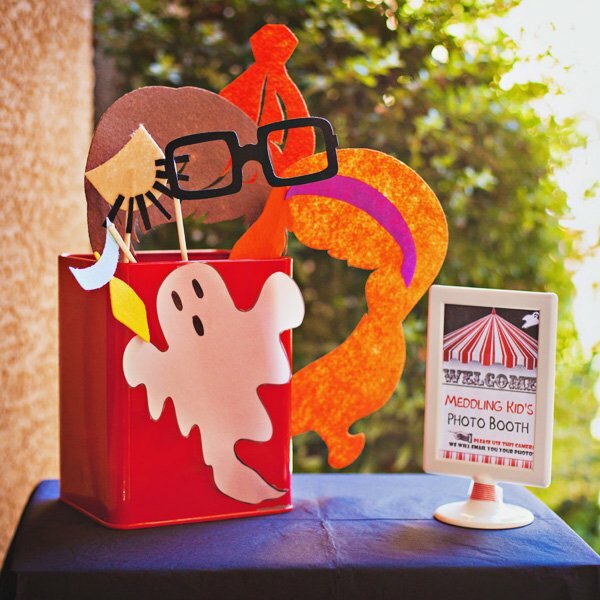 I wrapped boxes in black paper and used them to give height to the carnival tents. I glued little labels and ghosts I made all around. 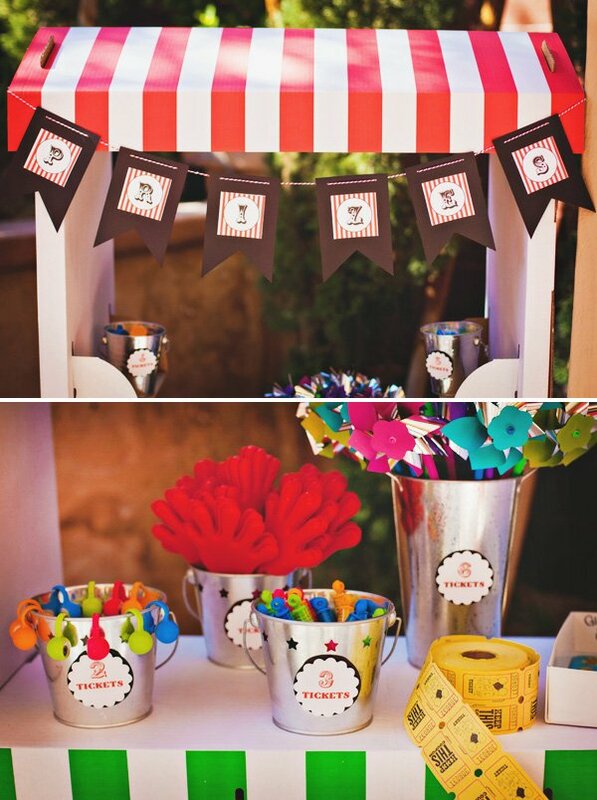 These adorable paper carnival tents are actually cupcake holders but I took out the inserts and used them as decorations. I absolutely loved them! On the kids’ table, I had a Mystery Machine treat box for each kid. Here they’d be able to store all their prizes as they won them. I made these adorable gum ball machines using clay pots, clay dishes, glue, glass fish bowls, wood balls, red spray paint, metallic scrapbook paper and bolts. They were super easy to make and they turned out to be darling. The dessert table is always my favorite part of any party. I usually focus the most time to it when I’m styling a party. Dina made this absolutely amazing name banner. She used characteristics from each character for each letter. I couldn’t believe how awesome it was and the attention to detail!! Aiden’s eyes lit up when we opened the package and he had his very own name in Scooby Doo font :) Thank you Dina…. you are seriously the best ever! Behind this black backdrop is my entertainment center. I was super happy to have found a large enough roll of paper to cover a few walls in my house and create pitch black backdrops. I made scary eyes to stare back from the dark. We hung spider webs around backdrop paper to make the edge less noticeable. 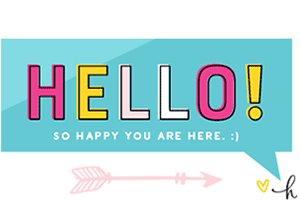 I made this banner using the die-cut letters Dina sent me, ribbon and scrapbook paper sheets. I wanted the carnival theme to continue onto the desserts so we decided to have churros, cotton candy, candied apples along with other desserts. 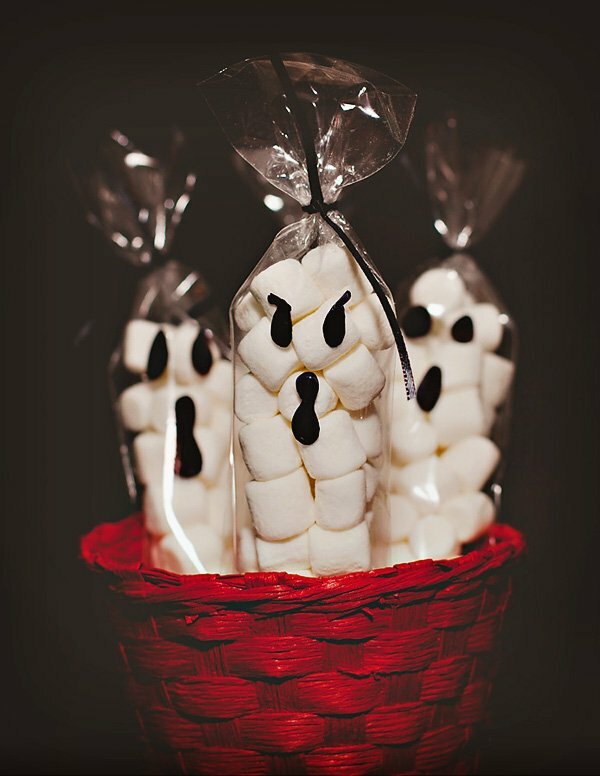 I was inspired by The Gaines Gang and made Ghost marshmallow baggies. 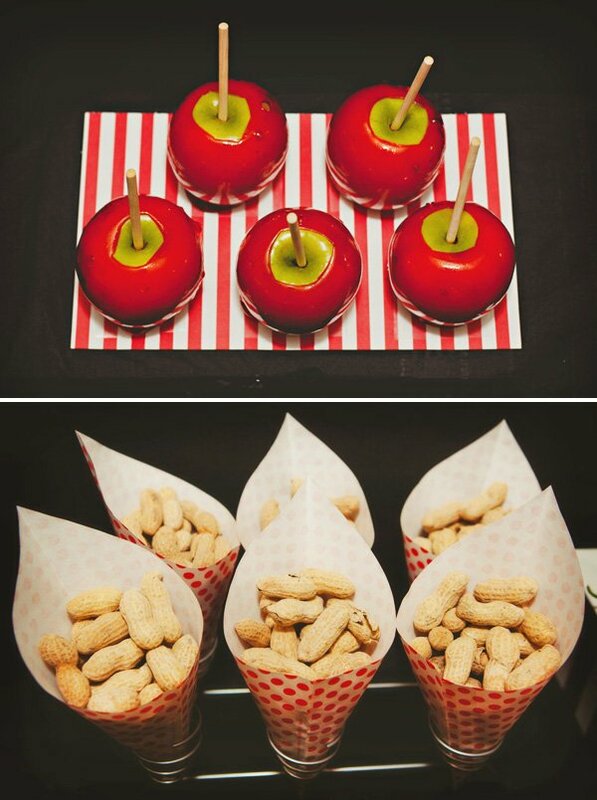 I’m thinking of making these again for Halloween. 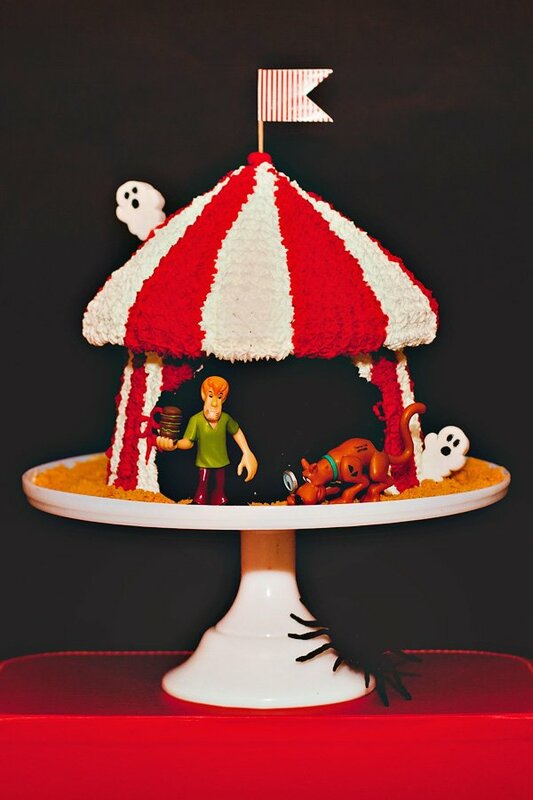 I was able to purchase a copy of Scooby Doo The Haunted Carnival book on Amazon from a private vendor. 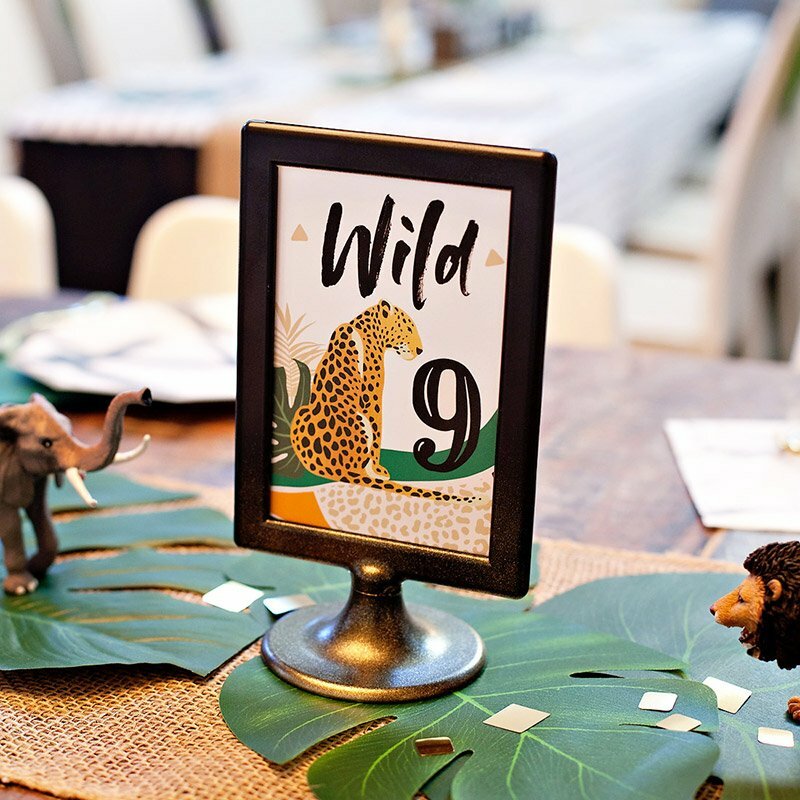 It gave the dessert table a nostalgic touch. I baked chocolate and red velvet cupcakes in these cupcake cups. After using these, I don’t think I’ll ever use regular liners again. I loved how cute they looked and how well the cupcakes baked in them. I then decorated the cupcakes with Keebler’s Scooby Doo treat graham crackers and KRAFT Jet-Puffed GhostMallows. I was lucky to have my mom make Aiden’s cake again. She makes the cutest buttercream cakes that also taste divine. Aiden absolutely loved his cake. 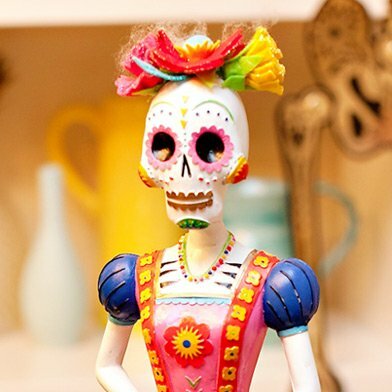 After cracking open the piñata and enjoying a full day of games and food, our guests started heading out the door. 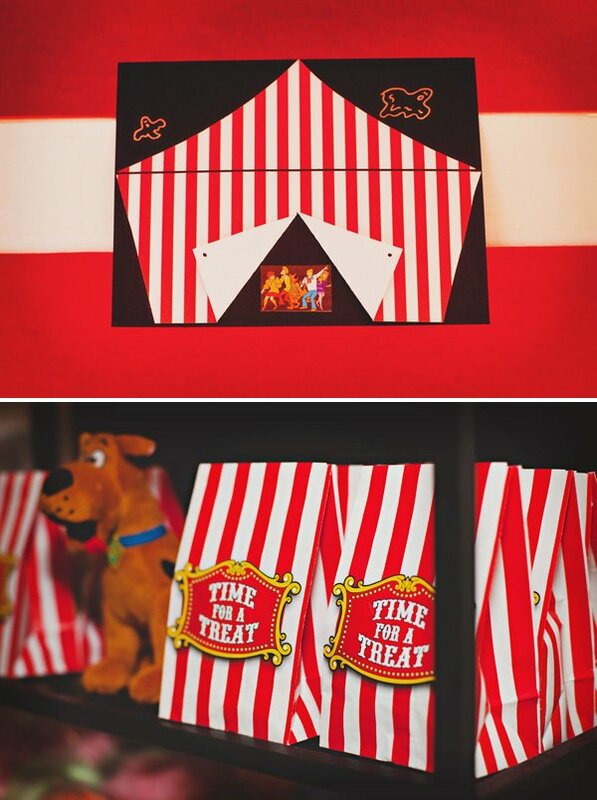 I styled a little favor center by the door so everyone could grab their “mystery treats” on their way out. I filled mini treat bags with gum balls for the adults. We had four different colors and flavors of cotton candy individually bagged and tied with a red ribbon. I initially wanted to buy or rent a cotton candy machine but after thinking about it I knew it would be a mess and I had no space for it. I decided to order them instead. I’m so happy I did. B Sweet Candy Boutique makes the best cotton candy and they are here in Las Vegas! I filled large favor bags with individual tags for the kids. I stuffed them with all the tools they need to solve mysteries when they get home – flash light, magnifying glass, word puzzles, and Scooby Doo treats and gummies. Just like the prizes banner, I made another one for the favor station. 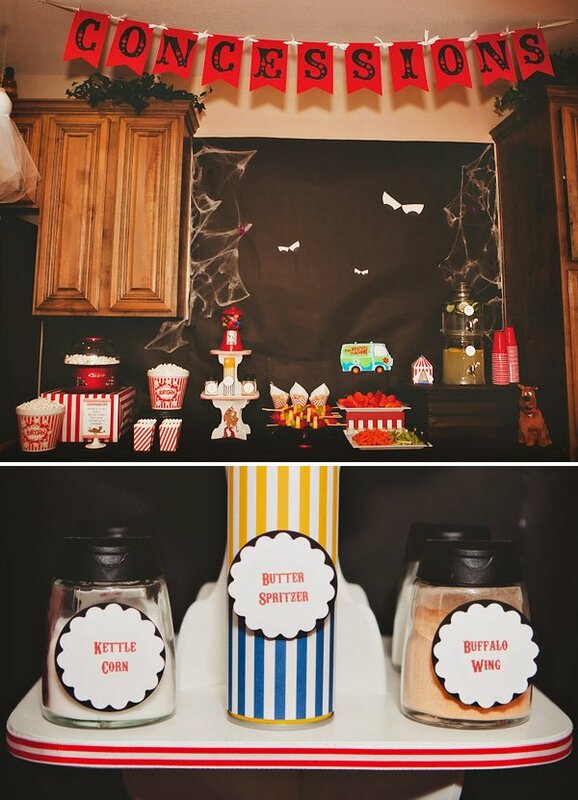 These banners are the easiest to make and they really make the space look festive and cute. 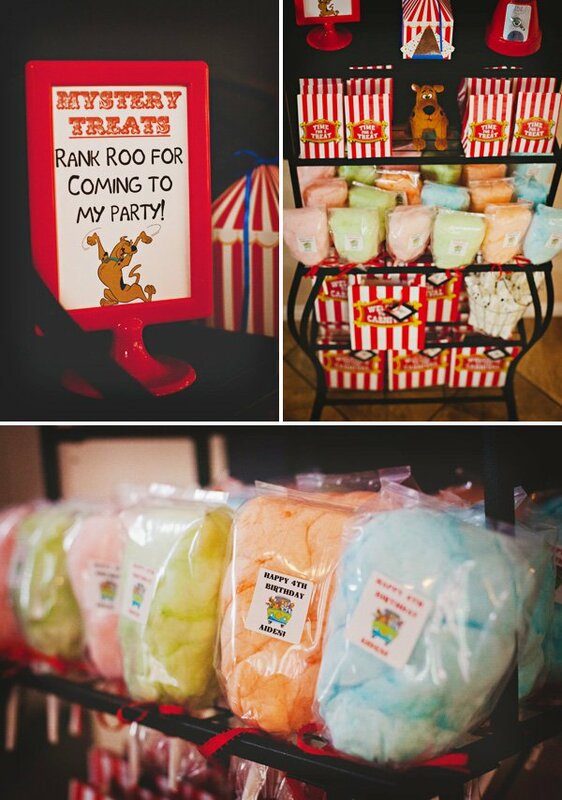 Rank roo for reading about Aiden’s party extravaganza!! 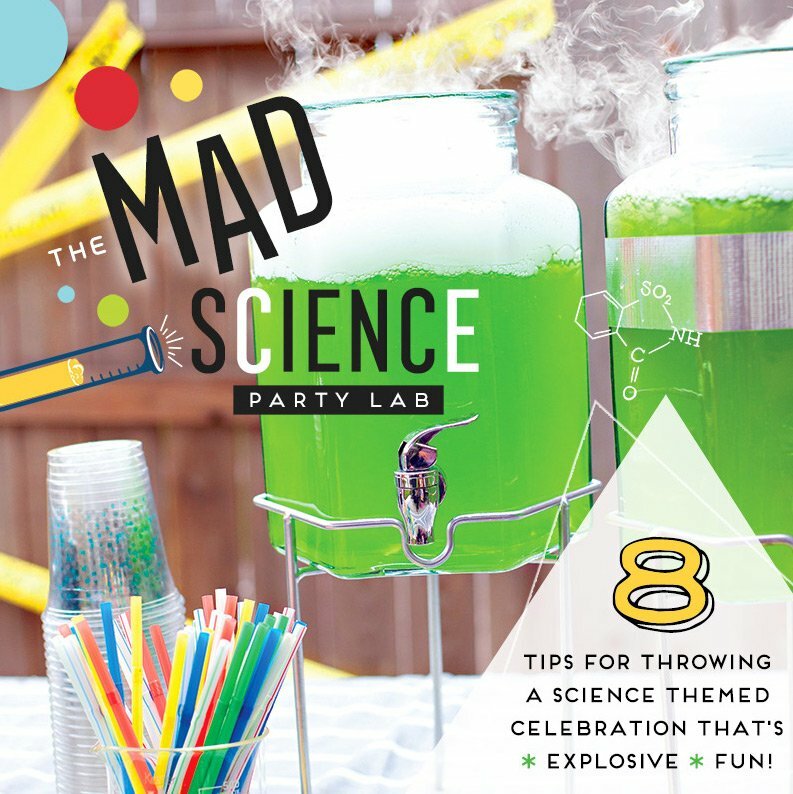 I’m so happy to see my little Aiden’s bday party featured here. Thanks so much Jenn & team for sharing it with the world. Hope it inspires many :) XOXO! Wow! That looks like a lot of work but soooo worth it! What a fantastic party that must have been!